Aopen i915GA-HFS. This one got a lot of video outputs too, like the i915GMm-HFS. Maybe a good alternative to the solutions from Asus and expensive PM mobos with mobile chipsets? interesting... I can't quite tell but it doesn't look like this board supports socket 478 heatsinks? I stuck a Z7000 on my 915 board and it won't fit w/o having to cut away a bunch of the fins in two different places. Some of the fins run into the VReg thingies and some nearby caps, the other fins are blocked by the pair of FSB jumpers. -and from the pic of this new one, it looks like the socket area is just as tight as the original 915 board. Oh, and initial testing has revealed that the supplied heatsink is a POS as I thought it might be. A 20W Dothan idles at 55°C with the whiny little fan running at a full 3000+ rpm 12V setting. Do you think that temp is correct? I have had the same experience, high idle temps, with supplied useless heatsink. It is really hot to the touch, so temp readings are might be correct. I will try to fit an old Zalman ZM80A heatpipe VGA cooler instead. If a zalman 7000 can fit just by cutting fins then that's better than I thought at least. It does seem like the motherboard manufacturers keep giving silent pc'ers ALMOST perfect P-M motherboards. Yeah, let the Dremel do it's work!! Ralf: Does it take a lot of cutting in the Z7k, what do you say? Yes, definitely! The heatsink gets hotter than hell! Not a lot. Initial layout looks like you'll need to grind fins in at least two, maybe three different locations. The grinding will be down near the base of the heatsink. The more significant impediment will be fabbing a set of standoffs of the correct height and diameter to mount the heatsink the precise amount above the board. I've spent a lot of time researching this and doing some drawings. I'll be ordering parts from McMaster next week and will give it a try. Board is a "no go" with the stock heatsink, something needs to be done. Another possibility is a 80/92/120mm fan suspended above the stock heatsink on a Zalman bracket, although I have my doubts because the stock heatsink is extremely small. It's actually about half the size of the Northbridge heatsink for pete's sake! "So near, yet so far....."
The more significant impediment will be fabbing a set of standoffs of the correct height and diameter to mount the heatsink the precise amount above the board. I've spent a lot of time researching this and doing some drawings. I'll be ordering parts from McMaster next week and will give it a try. Getting the correct height for the standoffs should be quite easy, you only need the height for CPU + socket for AXP and PM, and you already know the height for the AXP standoff, 14 mm. As for the diameter, I don't think it's that important, just use bolts that goes straight through mobo, standoff and clip instead. Put a nut on the top. Or maybe combining it with springs if you are afraid that you'll crack the core. and you already know the height for the AXP standoff, 14 mm. Yes, it is important because there's a bunch of components very close to the mounting holes. Standoff can't safely be more than 6mm in diameter. That limitation takes a lot of nice premade precision bushings out of the running and gives me less to choose from. Overall, it's no real biggy, it's just that right now I have to do this project w/o access to a machine shop like I usually have. Normally I could whip something up on the lathe in no time at all. Now I have to work up a solution from pre-made parts. I meant these two used for Athlon XP boards with mounting holes, blue and white. They come with the 7000A and 7000B. Zalman calls it clip support, and I'm actually not sure if "standoff" is a correct word for these. Sorry about that. I meant earlier that you could use the blue one. Cut it in three pieces. Use the two cylinders that you get and then make them shorter so they have the right height for a PM. I'm really not good in describing this in English! I was only thinking inner diameter only. Yes of course, outer diameter is important, especially on that mobo. I meant these two used for Athlon XP boards with mounting holes, blue and white. They come with the 7000A and 7000B. Cool! Guess I'll have to see if I saved those parts, or tossed 'em. Might make a good starting place. Thanks! Have you found any standoffs? Any progress? The new board features a socket 478 heatsink retention bracket, a welcome relief after the tiny non-standard HSF of the i915GMm-HFS. Really?? It doesn't look like that in the pictures. Maybe they've changed the design, I really hope so. Mats, you beat me to it. I'm hoping it really is a socket 478 retention bracket now... although in the new pic, the Northbridge is fanless so it's definitely a new picture, yet it still doesn't look like a socket 478. Lots of interesting things coming out. I like the super cheap Gigabyte ramdisk too! I'm hoping it really is a socket 478 retention bracket now... although in the new pic, the Northbridge is fanless so it's definitely a new picture, yet it still doesn't look like a socket 478.! It's not 478 rectangular style, you can see it's square shaped like the PM µATX mobo. And it's not much bigger than the NB cooler. The reason is maybe that the final version is not finished, Aopen still won't show any pic with the specs. Spent a few hours looking for the Zalman parts but couldn't find them. I've found lots of other potential candidates online, but it was a national holiday yesterday and everything was closed, so I couldn't order anything. Plus I'm busy with other projects. I'm definitely going to do it though, and will post results when I have some. While I appreciate that some might really have a need for the features of 915 chipsets (which seem pretty modest at this point) and others just like to solve problems, I'm somewhat surprised that the CT-479 solution is not more popular here. Since I've a good number of flavors of P4P800's (D's, -VM's, -E's, SE's), I've been able to explore the CT-479 with a number of boards and CPU's, and ASUS seems to have a really good solution. For example, this weekend I took my son's machine (P4P800D/3.0C combo) and replaced the P4 with a CT-479, and a 1.7 Dothan overclocked to 2.26 in the BIOS and undervolted to 1.15 with EIST) using the ASUS HS, a 70-80mm adapter and a Panaflo L1A undervolted to about 5-6v. It's fast, cool and quiet. What's not to like? Well, the FSB is only 133MHz and the RAM only runs at 166MHz (will the 915 be any better with a Dothan? ), so in about a week I should be getting a 1.6 Sonoma (C0 stepping) which people seem to have good luck getting to higher FSB's and RAM settings. I'll use EIST for reducing the multiplier and Clockgen to overclock--both seem to work without problems on these boards. The upshot: why trouble with using a traditional high end HS with low speed fans when the ASUS CT-479 HS is totally adequate once you get away from the 70mm fan? Even under full load it's hard to get one of these CPU's over 45 degrees. And you get all of the benefits of 865 chipsets over 855 (mainly dual channel RAM, easy overclocking and inexpensive motherboards). So why mess with the AOPEN 915 board and it's poor HS. Is the CT-479 just not challenging enough? I'm not meaning to highjack this thread (which I will follow with interest), but I'm curious about the goal of it. I have a sneaking suspicion that you're correct, and I'd love to play with a CT-479 seeing as how I've got my good 'ol reliable P4P800-D sitting here humming away right beside me. Maybe one of these days I'll get one, but for now I'm pretty busy dealing with this 915GMm board. My main concern wit the CT-479 is the heatsink that's on it. I can run my 855GMe board dead silent with my Nexus-ized Zalman 7000AlCu and I suspect that I couldn't quite do the same with the stock CT-470 heatsink, whether I used the stock fan or kludged something up. I think it depends on what you regard as "dead silent." For example, to my ears (which I assume are older than yours), a non-clicking Japanese-made 80mm L1A at the lowest setting on a fanmate is dead silent. So in my primary work machine which has a fanless PSU, a Nexus exhaust fan at about 700 rpm and a Samsung notebook drive, I can't hear it at all (unless I stick my head right up against the case), even at middle of the night insomnia times. In this machine which uses an AOPEN 855GMe, I use an XP-90 and the 80mm L1A. On my son's machine which uses a CT-479 and the ASUS cooler I also use the same kind of L1A at the same setting. Both are totally adequate with idle temps in the 30-35 range, and although there are too many other differences in circumstances to make a direct comparison, e.g., different cases and ambient temperatures, I really don't think that his runs more than a few degrees warmer than mine. I think we've just so gotten into the habit of big HS's that it's hard to accept how modest the cooling needs of P-M's are. I think it depends on what you regard as "dead silent." For example, to my ears (which I assume are older than yours), a non-clicking Japanese-made 80mm L1A at the lowest setting on a Fanmate is dead silent. Yep, "dead silent" is certainly relative! To me, dead silent means I can't hear my system running when I'm sitting in front of the monitor and it's sitting on the floor about 2-3 feet to my right. And when it's really quiet in hear, I can just barely hear the sound of my main system that's using a 5V M1A on the PSU, and a pair of 5V 120mm Nexus fans for the CPU and case. So it's not really dead silent (well for the few rare times that it's actually that quiet in here), but I put up with it because it's running a 70W+ 3.0GHz P4. In a Pentium M box, I'd be waaay more critical of the noise, just because the silly things run so cool that expectations are much higher. Doesn't it seem that a P-M + 2.5" HDD, fanless vidcard based system should be able to run quieter than my Old Skool P4 rig? That's what I'm shooting for with a P-M rig, and really will not be satisfied if I can't get it. And FWIW,unfortunately I can hear the quiet whine of a 5V L1A at 2-3 feet (as a matter of fact, there's one that I recently added to a 915GMm test system that's been bugging the heck out of me for the past few days. I keep wanting to turn it off but I need it's cooling) even though my ears are probably past their prime. Ralf, I agree entirely with your standard and was thrilled with my move from a quiet 2.6C to a silent P-M (using a fanless PSU was necessary, since the L1A at 5v in the PSU was audible to me). In one sense, I feel almost sad that the quest for me is over. Since you can hear the L1A and I can't, presumably your ears are still more sensitive to high pitch noises than mine. You have two choices--wait until your ears reach the age of 64 or continue the quest! There's a P-M sticky at xtremesystems.org (sorry I don't know how to shorten the url) with a lot of info on the CT-479. If you look at pages 12-16, you'll see that several people are now using Zalman 7000's and 7700's with very minor mods (flipping over the mounting bars?) on the CT-479, so Ralf your P4P800 might be holding a P-M soon. Last edited by hmsrolst on Fri Jul 08, 2005 9:46 am, edited 1 time in total. nice link, that's a site I don't visit but they sure have a lot of useful info on the CT-479. Yes. Simply unscrew the bolts holding the fan, lift out the fan-housing, flip the bracket 180degrees and remount the fan. 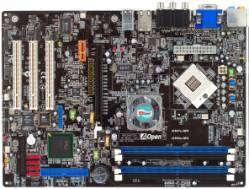 I just went onto Aopen's site and looked at their current specs on their ATX P-M board. It currently lists in the packaging that it comes with 1 CPU Cooler, similar to how they've bundled their M-ATX board with a cooler. This implies to me that it is NOT a socket 478 retention bracket; otherwise they may not have needed to supply the user with a cooler. Hopefully this still reflects an earlier design and when it's released it'll have that elusive 478 bracket. I don't think that is necessarily true for P-M CPUs though as I thought the retail version of P-Ms don't come with heatsinks thus Aopen may have taken it upon themselves to supply the default heatsink. For those who had this board in the back of their minds, aopen's website now has the picture of this board back on their website; the picture had dissappeared for a while and some of us hoped that meant that the finished mobo would have a socket 478 compatible heatsink mount when it finally came out and the previous pic was just some early beta image. Unfortunately, it is still showing an image of a non-standard cpu heatsink mount AND a northbridge heatsink fan! So it's starting to look more and more like those crazy aopen guys are going to stick to their proprietary mount points. Of course maybe the website is still wrong. They do have erroneous data in the specs still after all.